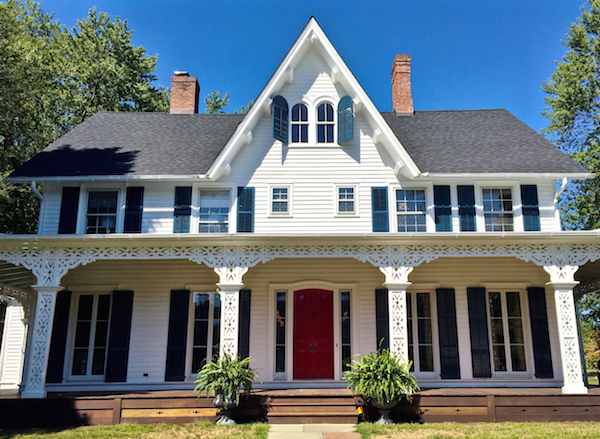 What to do when a 19th century church on a historic town green in Connecticut needs to restore its rectory, also a classic structure from 1834? 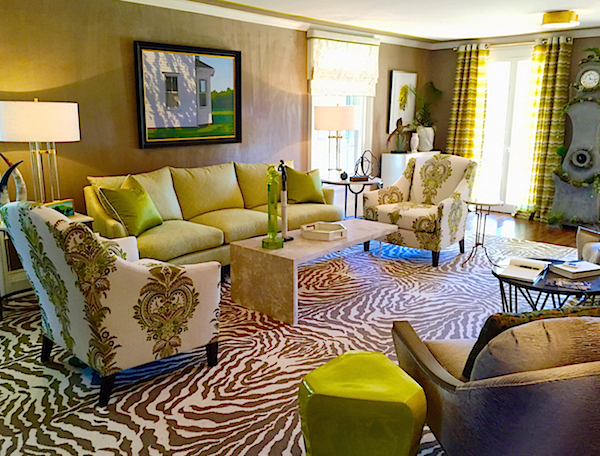 Organize a designer showhouse of course! 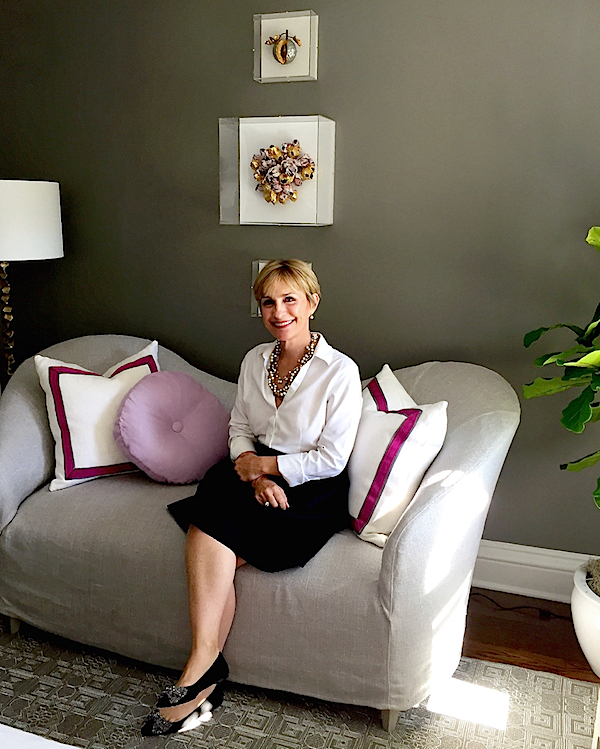 Showhouse on the Green, opening Saturday in Fairfield, CT, celebrates the history and future of St. Paul’s Episcopal Church and in honor of its wide ranging ministries, will be donating a portion of the proceeds to Operation Hope, which provides food and shelter to local families in need. The Gothic revival rectory, above, will be receiving a full facelift inside and out, including interiors by 15 designers. Although not quite finished when I stopped by, I got a peek at a few rooms to share. 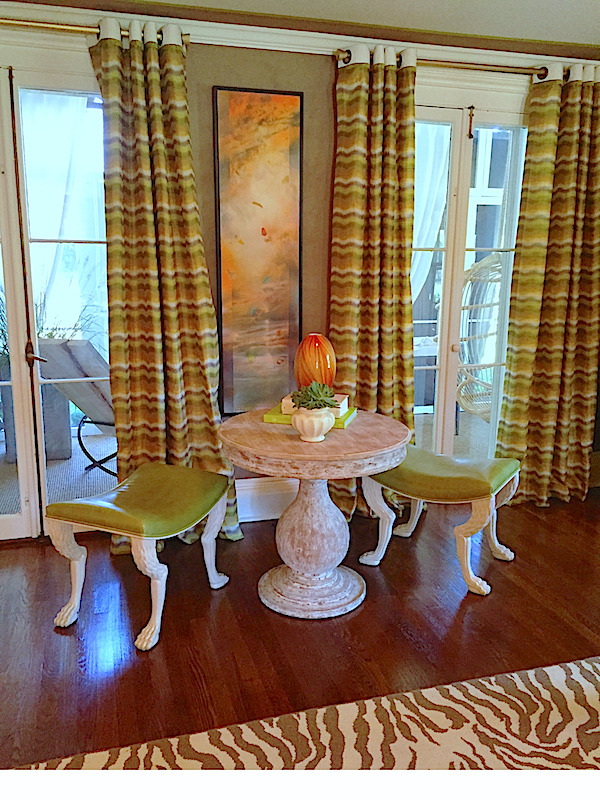 On the first floor, Charles Pavarini designed the spacious living room, using fabrics from Kravet in a fresh green and brown palette of “Organic Modernism” that connects to the adjoining outdoor spaces. 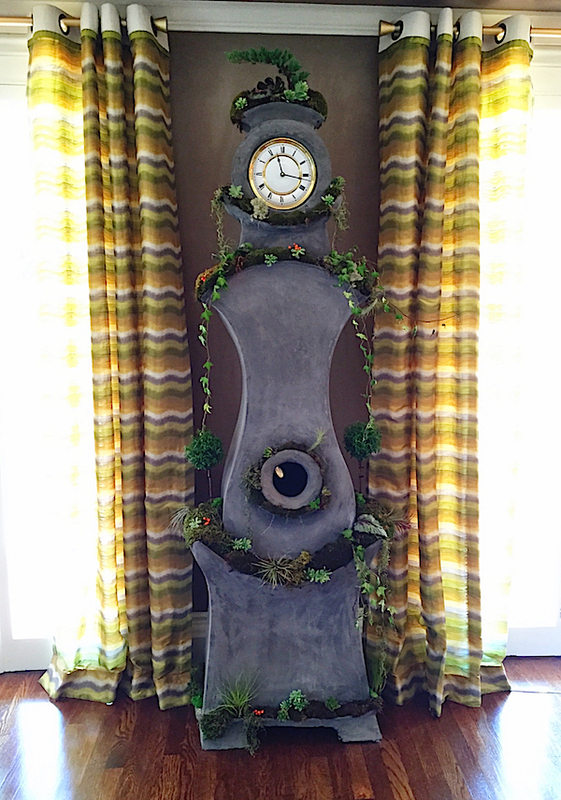 To further reference the natural environment, Charles commissioned the “living” clock as a functional piece of art, with live plants and working clock. 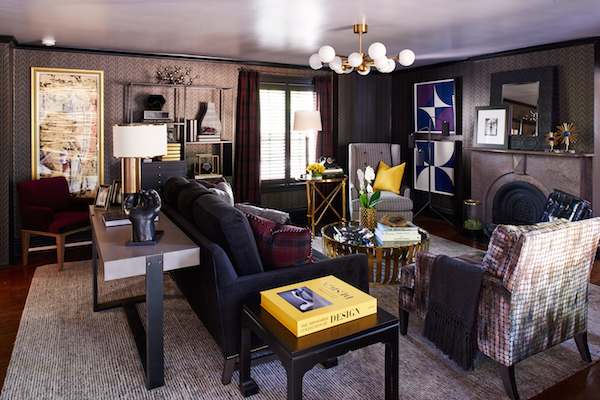 Angela Camarda from Lillian August designed a masculine sitting room with glints of brass for a glamorous touch. with a fashion inspired plum and black scheme. 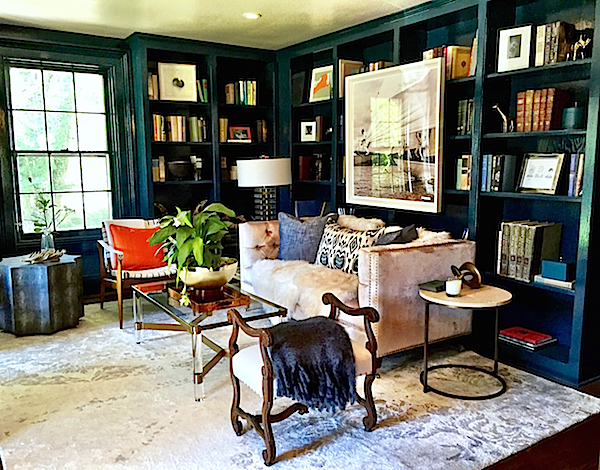 The library was designed virtually by an unusual collaboration with media sponsor Connecticut Cottages & Gardens, online home design platform Decorist and designer Christina Murphy, a “celebrity designer” available through the site, as well as Safavieh, who provided the furnishings, selected from their Couture Collection, and oversaw the installation. Painted in the always chic Farrow & Ball Hague Blue, the room features a stylish mix, showing the possibilities available through the online design site. 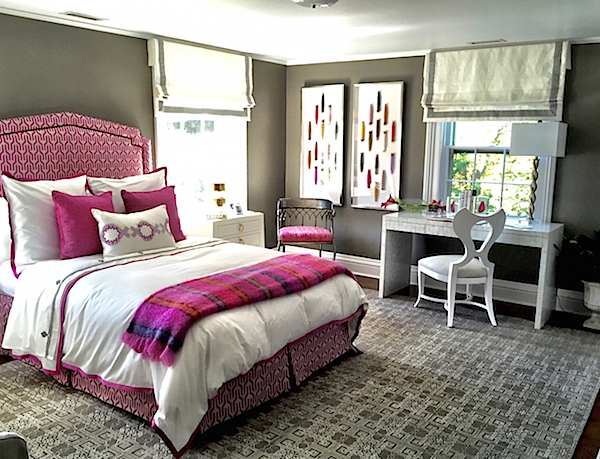 Upstairs, my favorite was Carey Karlan‘s pretty girl’s bedroom – youthful and fresh, yet sophisticated enough to last. 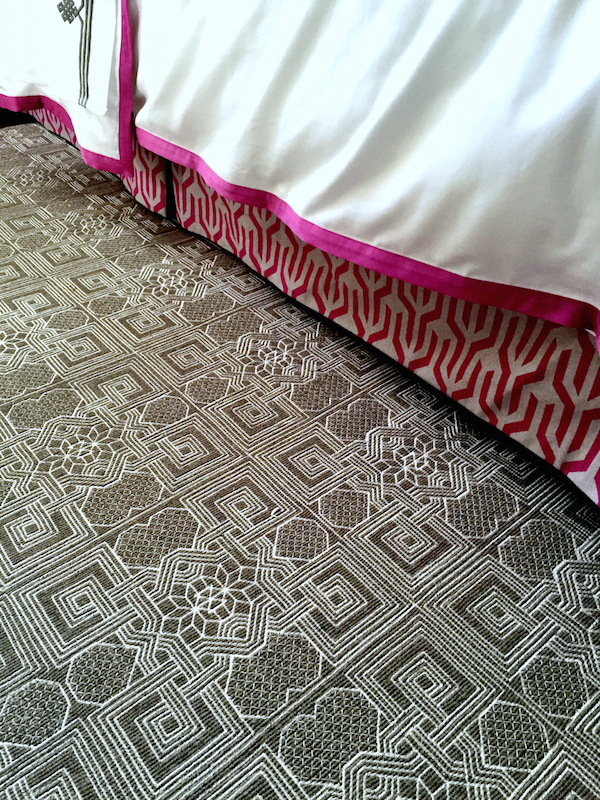 was anchored by Farrow and Ball‘s Mole’s Breath on the walls and J. D. Staron‘s handsome new handloomed carpet which is then embroidered for a wonderful subtle texture and pattern. 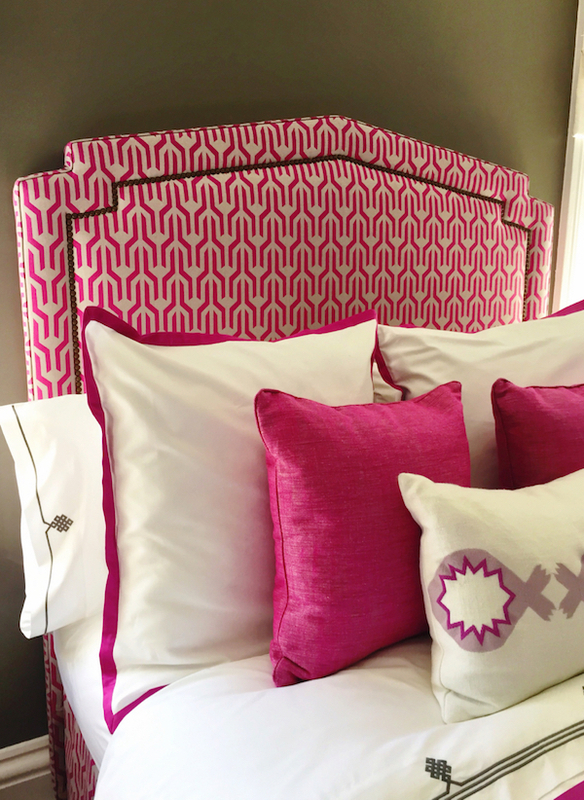 The designer enjoying a quiet moment on the bedroom’s slipcovered settee, below. 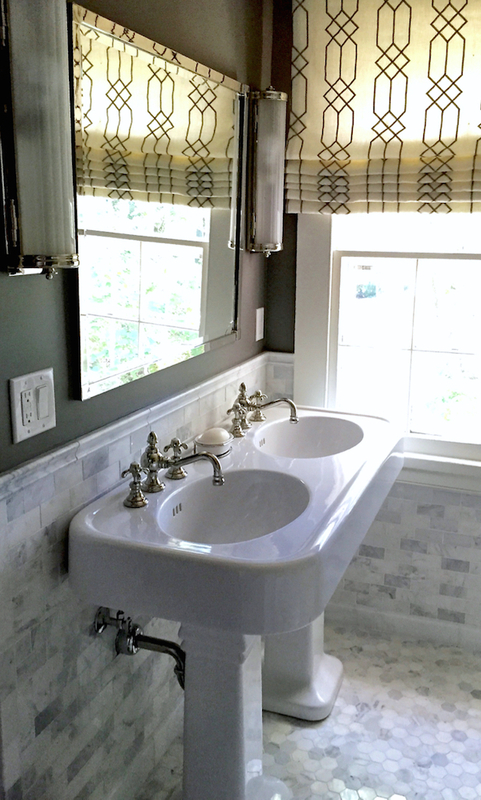 The bathrooms were all designed by Joseph Passero of Klaff’s and I particularly liked this one with its distinctive double washstand. If in the area, Friday evening is the Gala Preview Cocktail Party. 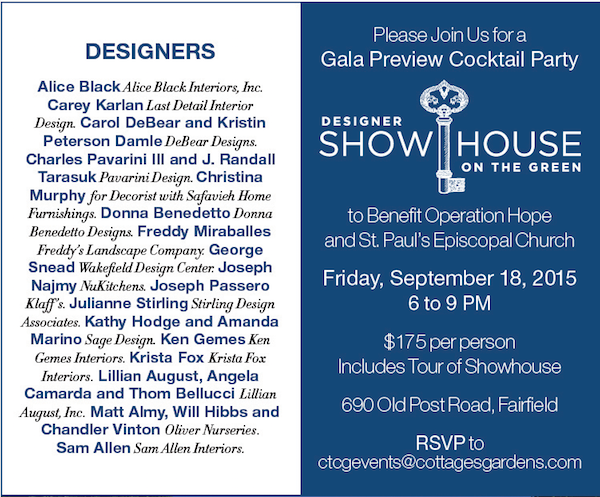 Benefitting both Operation Hope and St. Paul’s, it is an opportunity to meet the designers and design chair Ellie Cullman. 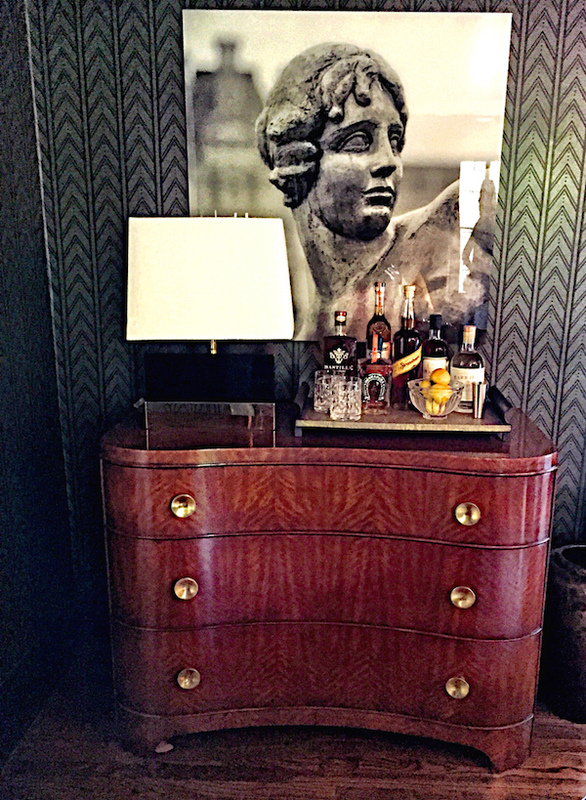 The showhouse opens officially Saturday and will run through October 25. 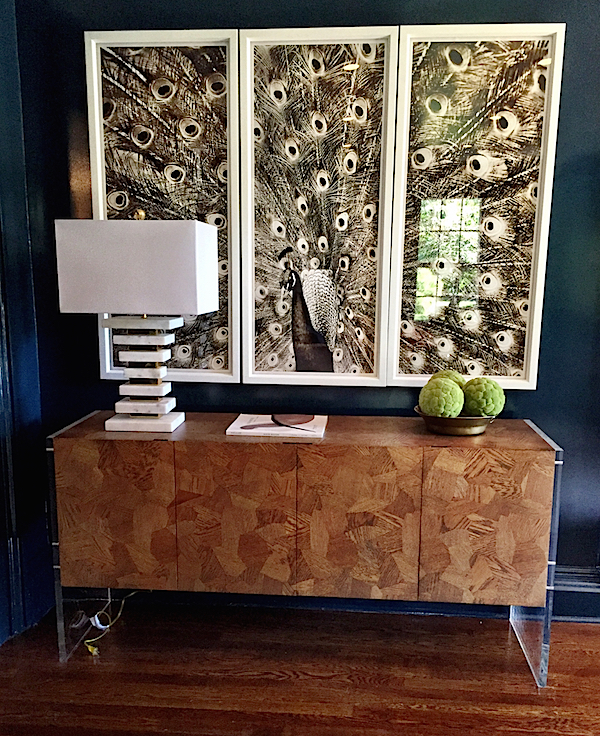 This entry posted in architecture, interior design. Entry Tags: Connecticut Cottages and Gardens, Farrow & Ball, interior design, Serena & Lily, Showhouse Bookmark the permalink. 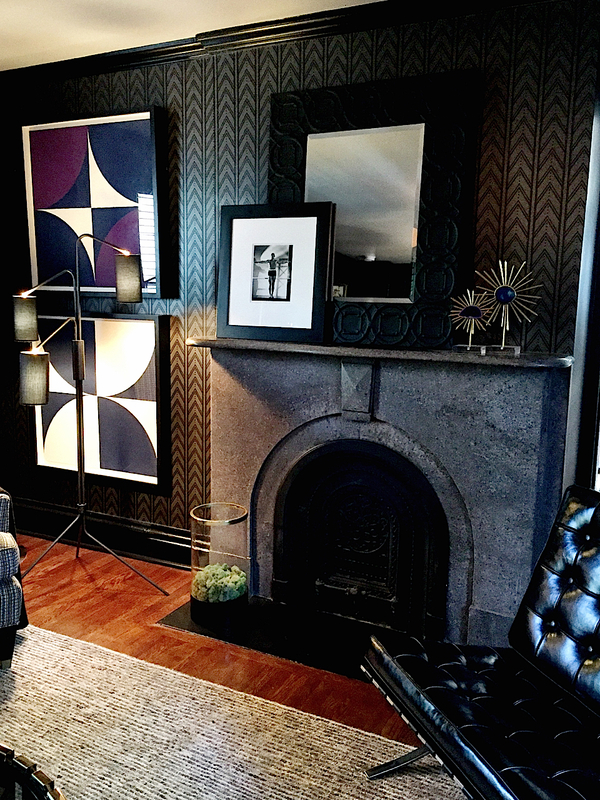 That clock is certainly a conversation piece and I adore the bedroom!! We’re so glad to have you as a roving reporter, Q, since we’re trying so hard to get to this show house and have so much on our plates! That living clock is fabulous… Hope you are enjoying a wonderful weekend! 80 queries in 0.541 seconds.